Product information "German mug with Code of Arms, Eagle on the front with State crests and State crests on the side"
Note: This beer stein is specially desigend from us and only avaible here! 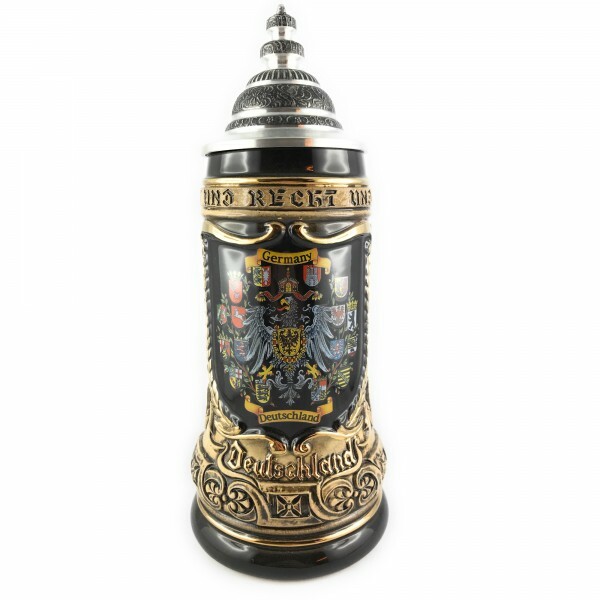 New designed german beer stein with the code of Arms on the top. The Eagle on the front with the state crests surrounding. Also on the sides the molded german 16 state crest. Very nice german drinking mug, great gift. Related links to "German mug with Code of Arms, Eagle on the front with State crests and State crests on the side"
Customer evaluation for "German mug with Code of Arms, Eagle on the front with State crests and State crests on the side"